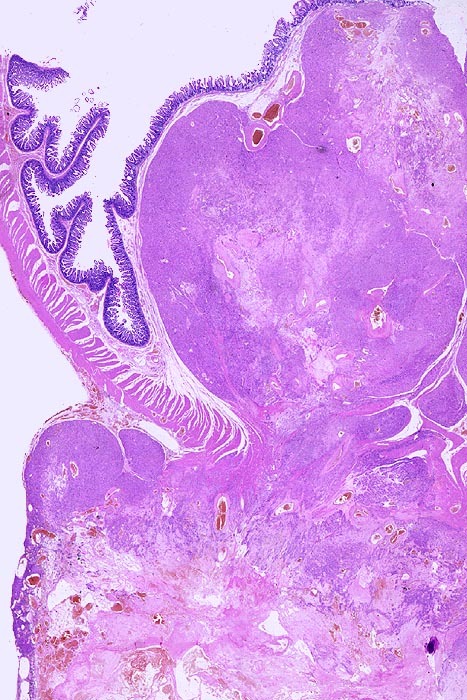 Microscopically, GISTs are mesenchymal neoplasms that involve the wall of the intestine. They often have a well-demarcated, lobulated contours. This large example shows necrosis (bottom of image). GISTs arise from the interstitial cells of Cajal, which serve as pacemakers for the gastrointestinal tract. Image Copyright: pathorama.ch.